Since opening in 2012 Magic Moments Floral Design has established a great reputation for excellence in design and service. We have managed to forge our very own unique identity and our work is very highly regarded within the industry. 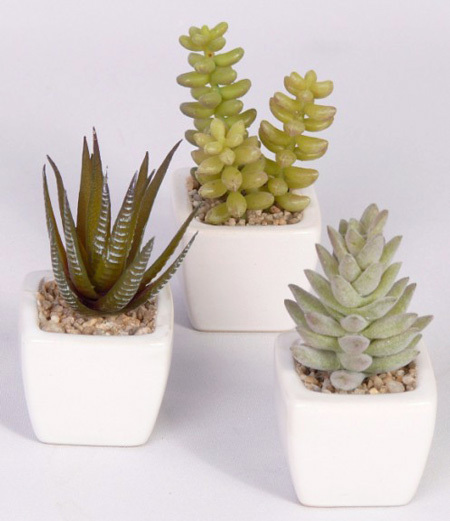 Our flourishing retail flower business is built on the promise to only deliver the freshest flowers from the finest sources from around the globe combined with our excellent customer service guarantee. Our highly skilled team of Floral Designers combining over 40 years experience have trained to the highest levels of design in the U.S.A, Asia & Eastern Europe and bring together influences from all around the world. We specialise in Wedding flowers, Event flowers, Bespoke Bouquets and Flower Arrangements for all occasions. Both myself and Edward just want to say thank you so much for making are day so special! From the church to the reception in Knightsbrook Hotel everything was perfect every one was blown away! The hotel manager had never seen flowers like that! We got so many compliments in the church - it was amazing and the centerpieces were just what I wanted. Thank you and your staff again for all your hard work - it was all amazing, thank you again! 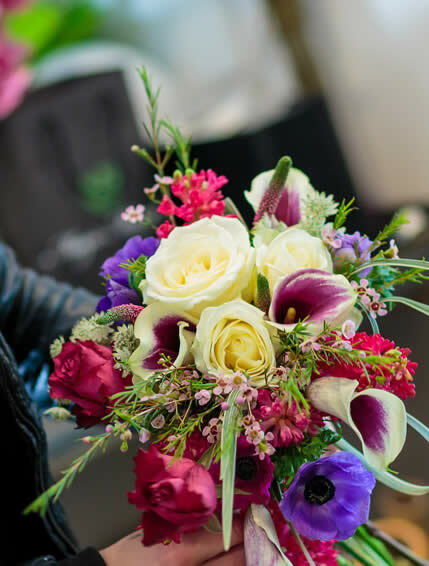 Here at Magic Moments Floral Design we know how important your wedding flowers are, how long you've waited and we really understand the time an effort you've given to get to this stage. That's why we dedicate so much of our time and thoughts to ensuring everything we do is perfectly designed for you. We specialise in wedding flower design and decor. From your bridal flowers, church flowers & reception flowers to the beautiful decor that finishes off your day we do it all. We promise always to excite with unique designs and services. We pride ourselves on our attention to detail in all areas of design and delivery. 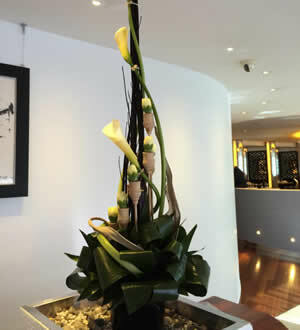 We deiliver your bouquets to you and are one step ahead of you all day making sure the scene is set for your arrival. Our church flowers tie in beautifully with your bridal flowers and what better way to finish your day than with some really beuatiful floral centerpieces. We work hard at making every piece unique so you can rest assured your 'big day' will be remembered long into the future. We can also offer silk flower and artificial flower arrangements and we even design preserved rose bouquets including the Brides Bouquet. Please enquire at consultation stage for full details. "Every week brings new breath taking designs, every week we are inundated with enquiries from our guests as to where we get our Floral Arrangements and every week we get great pleasure in telling everyone about Magic Moments. Thank you for all your beautiful work so far and long may it continue." Our signature work is immediately identifiable as Magic Moments Floral Design. 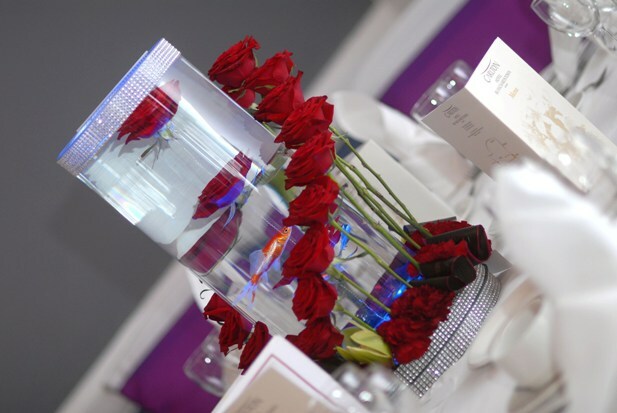 From bespoke centerpieces to venue theming our creative teams' ability to conjour up something new and unique is what has driven us to where we are now. Our passion for design, our knowledge of fresh & artificial flowers and our artistic background are what differentiate us from other companies. Weather your in the market for something small or a complete venue make over our team can deliver. Why not email us for a consultation or have us come to you. Please feel free to make an enquiry and one of our team will get back to you as soon as possible. "To the best flower guy in Ireland (& Staff). Dave we cannot thank you enough for everything you did for us to make our day so special! To say you went above and beyond is an understatement. The flowers & you were absolutely amazing and we will never forget either.. Thank you so much for everything..
Love, your favourite American couple,"
Our Cherry Blossom products are completely bespoke. They can't be found anywhere else in the world and have gained recognision as being the highest quality in Ireland with huge demand all over th ecountry. 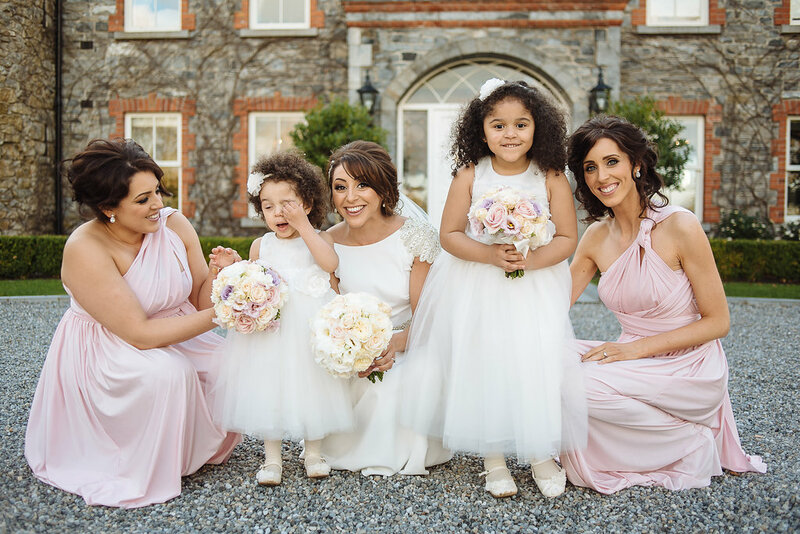 Their unique design captures the imagination of guests all over Ireland and our portfolio of cherry blossom weddings feature in some of Irelands most prestigeous castles, manors & exclusive venues as well as some more modest locations. As a group of designers we constantly strive to design relevant pieces. We make them in small batches so as to keep them exclusive with just one booking per day. We look past the trends and create our own. 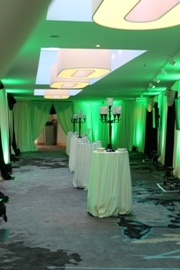 Great design surpasses trend and sty6le of the day and it offers a timelessness to your event. Our images speak for them selves. Our commitment to designing stunning weddings for our brides is unrivalled by other companies and our testimonials will atest to that. We love our jobs. Our Cherry Blossom designs illuminate our weddings and events and these products do just that. Exceptional design quality, made to suit any venue these products are about drama and presence. Every piece we make must be remarkable. 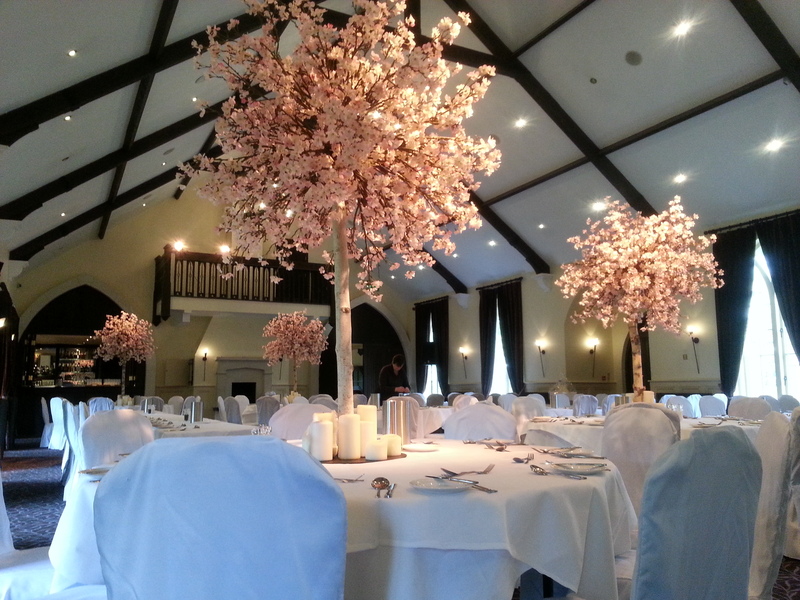 Our Cherry Blossomo Trees, Arches and Hanging Lanterns are availaible in 2 colors (Ivory & dusty pink) and can be complimented with a variety of bespoke florals and matchinig table centres that can really bring any ceremony or venue to life. We offer full planning service and stay with wyou all the way to your day making sure your table plan is optimised and that your reception room is stunning. Our team will walk you through it and not only design your dream wedding but go far beyond that with their little touches of absolute class. "I want to thank Dave for doing an absolute amazing job on our centre pieces for our big day . When I walked into the room I was blown away they were just beautiful! Exactly what I had in mind... Absolutely Perfect! As soon as I have pictures back I will post them to you . Thank you so much again. Amazingly creative, so artistic, inspiring and magical. For anyone looking to book Magic Moments - they are friendly and fun and very reliable, 100% highest quality floral design." Lorna Doak.